If you’re driving the NC500 (the now popular North Coast of Scotland road trip) then plan to make a stop at Ceannabeinne Beach, near Durness on the A838. 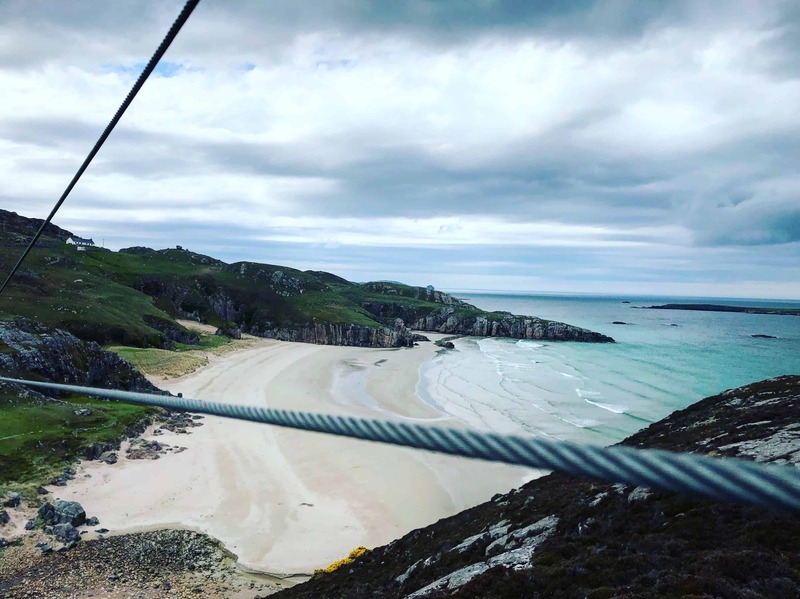 One, it’s an incredibly beautiful sandy beach and very accessible from the road, and two, if you’re a thrill seeker, you can now ride the Golden Eagle zip line (the nearest zip to the Atlantic Ocean in the UK) and enjoy arguably the best zip line in Scotland? 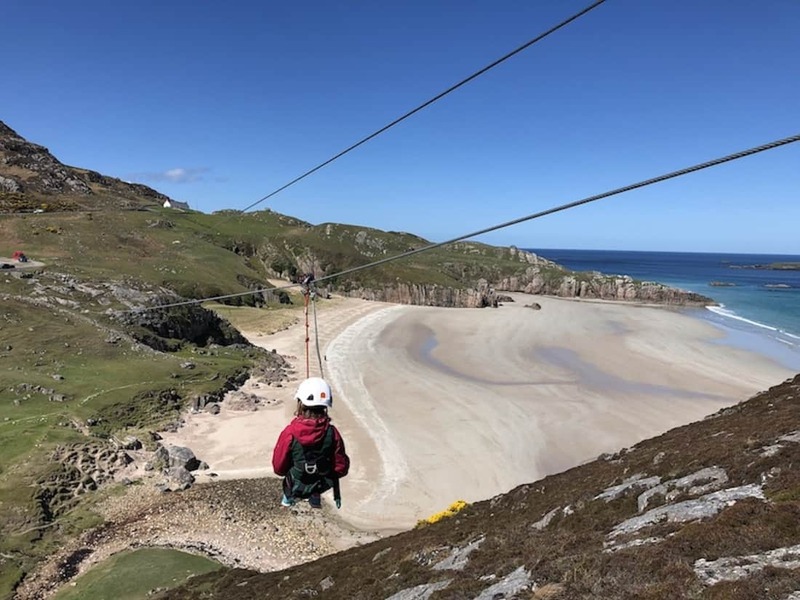 The 37 metre high zip line is the most northerly zip line in Scotland and straddles the North East section of Ceannabeinne beach, near Durness. 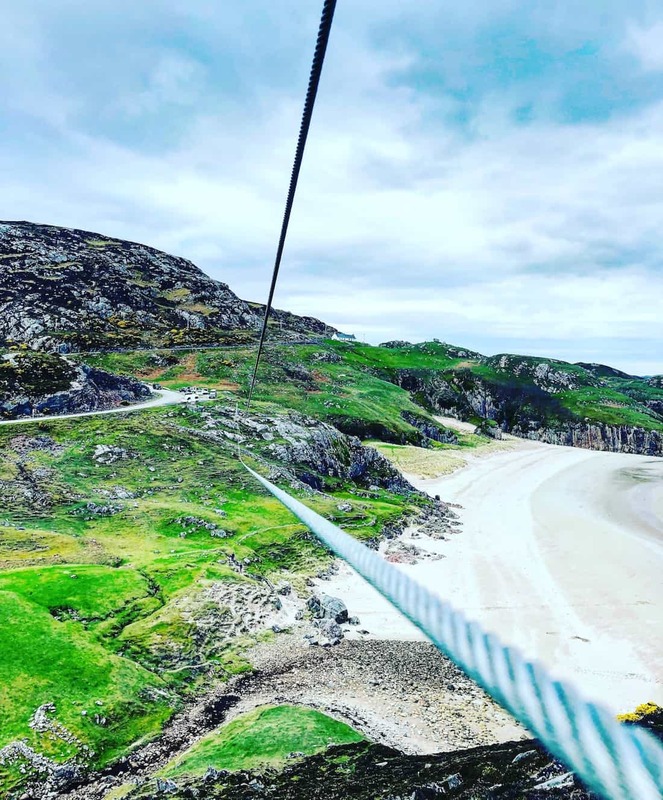 At 230 metres long, it’s not the longest in the UK but with speeds of up to 45 kph and with the stunning beach location, we think it’s potentially the best zip line in the the UK. 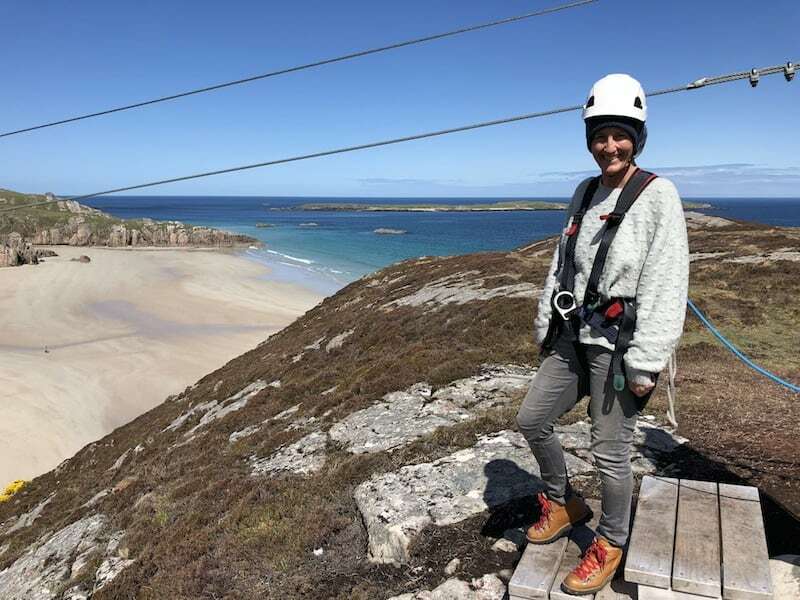 The zip line is clearly visible from the road, although if you’re driving from East to West and approaching Durness after driving around the large sea loch, Loch Eriboll, then you will round a corner and suddenly be upon it on the right hand side. There is a car park at Ceannabeinne beach so parking up is easy. The zip is super kid friendly. 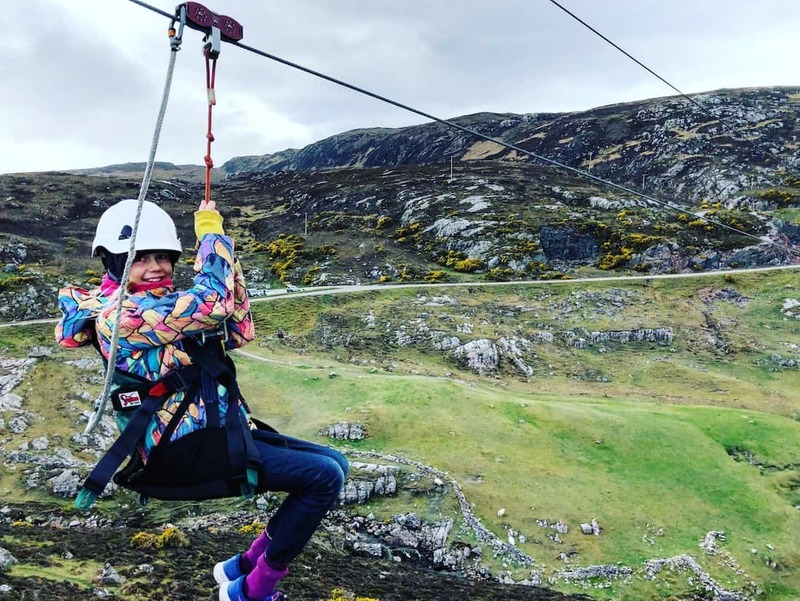 We loved that instead of a bog standard harness, Golden Eagle uses bucket type harnesses that you sit in. You feel nice and secure strapped in. All the safety equipment, harnesses and helmets are provided, with smaller harnesses being available for children. The zip is £12 per go with no booking is required. 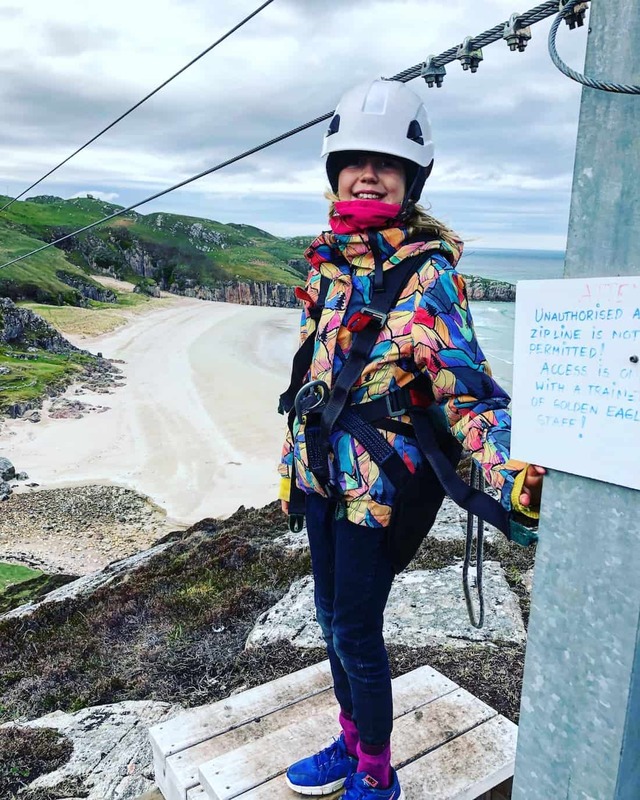 Opening times vary as the zip is heavily weather dependent, but the owners, Aro and Katerina (who hail from Estonia) post daily on The Golden Eagle Zipline facebook page @goldeneagleziplines as to whether they think the zip will be open the next day. 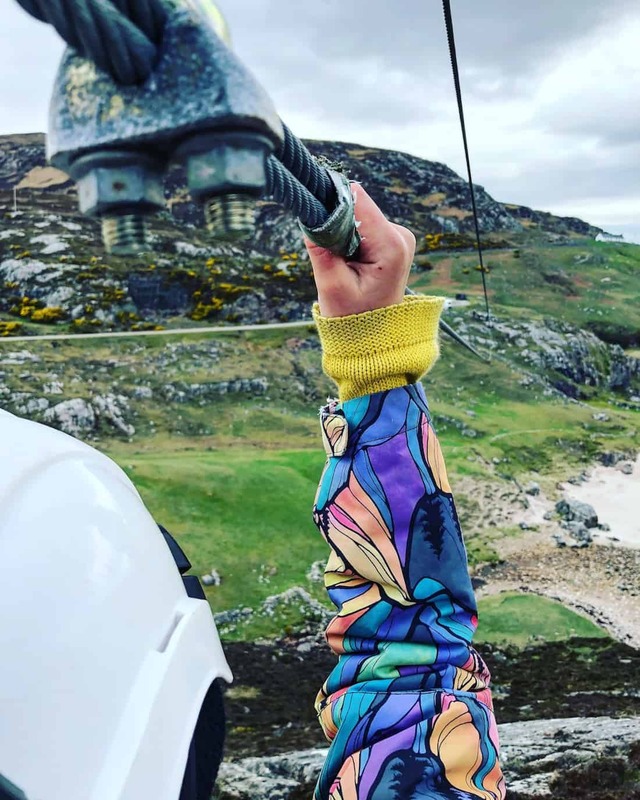 The brake system on the Ceannabeinne beach zip line is one of the kind in UK – it requires very little maintenance and also excludes any possible human error hence making the zip really safe. These kind of zip line brake systems are pretty common in North America with the zip line industry being far more advanced over there than in Europe. We were frothing to give it a go. My 9 year old had no qualms at all about leaping from the platform. The minimum weight is 20kg and max 115kg but both limits can be subject to a slight chances depending on the actual wind conditions. The youngest person so far to ride the zip was a 3 year old whilst, impressively, the oldest was 89 years old! My 7 year old was a bit nervous to take the leap so opted out on our first visit. She then amped herself to do it the next time, but on our next drive by, the zip was closed due to high winds (we hadn’t checked the facebook page before leaving!). On our final drive by on our way down to the Isle of Skye the conditions were perfect and she was stoked to join the small queue to take the jump. Amped and ready to go! She loved it so much, she did it a second time! 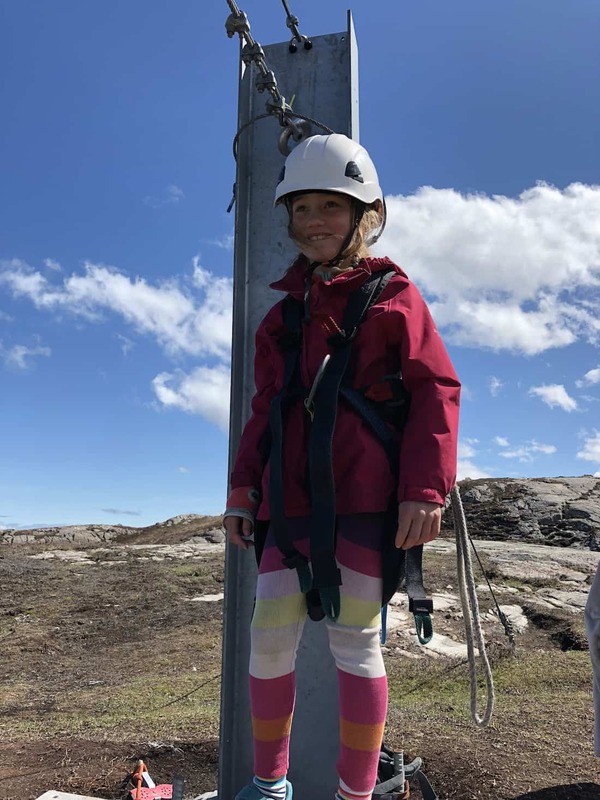 On her 230 metre zip adventure. She did it twice and loved it! It only takes a few seconds to fly across. Before you know it you’ve hit the braking system on the other end and trust me, you’ll be begging for another go. The good thing is the Golden Eagle Zip line offers a 50% discount for a second go on the same day on off peak periods. One reason to hit the NC500 on the shoulder of peak season travel! 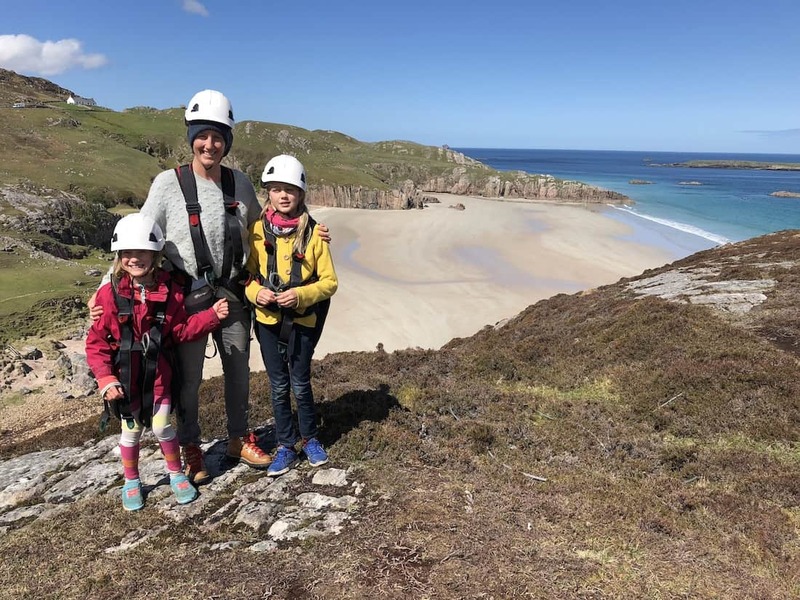 Arguably the most beautiful Northern beach of the Highlands, Ceannabeinne Beach (meaning head or ends of the mountain in gaelic) is a jaw dropping white sandy beach with with pink granite cliffs to the east of Durness. Traditionally known as Traigh Allt Chailgeag meaning ‘the beach of the burn of bereavement and death’ which refers to the story of a tragic death of an elderly woman who fell into the ‘burn’ (a stream) which flows into the sea and drowned. There is a small island out to sea called Eilean Hoan ( the burial island) which is a National Nature Reserve.. Eilean is the Gaelic for island. The limestone island provides rich pasture and was once was home to four windswept families until the Clearances. The beach is super accessible with only a short walk down to the sand from the car park. It’s a great beach to walk the dog and let the kids run on. At the end of the beach the granite rocks are also perfect for a little bouldering. So if you’re driving the NC500 route, definitely plan to add this to your NC500 itinerary. 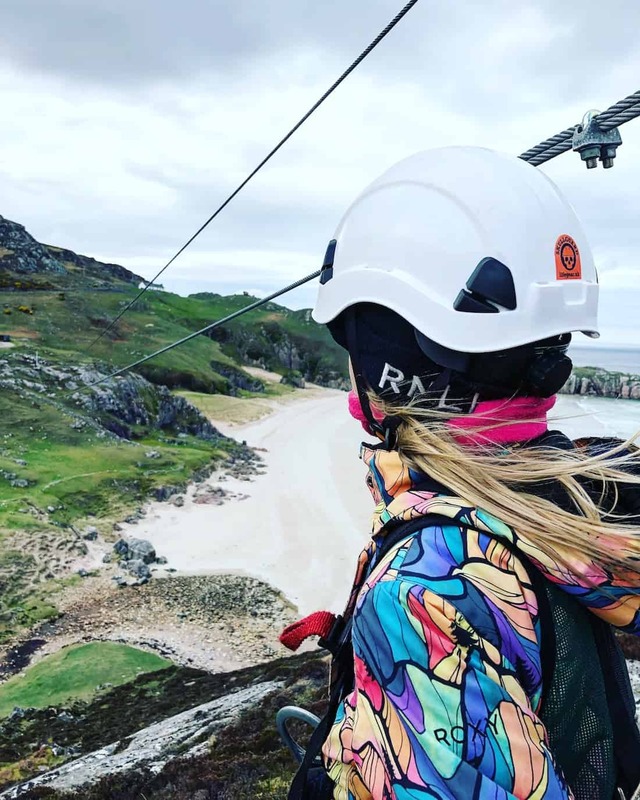 If you really want to ride the zip and have the time, I’d suggest staying near Durness over a couple of days soif the zip is closed due to bad weather or high winds, you’ll hopefully be able to do it another day. A big thanks to Aro and Katerina for letting us have so many amazing rides to review their amazing zipline. We reckon it’s definitely the most scenic and beautiful zips in the whole world! We’re hooked and will definitely be back again on another trip! 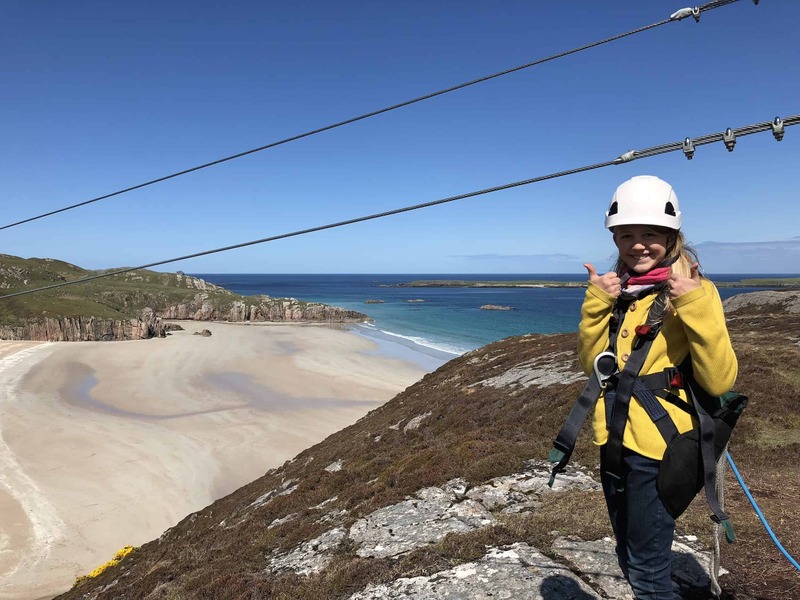 Have you visited Ceannabeinne beach or tried the Golden Eagle Zip? Let us know, we’d love to hear from you!